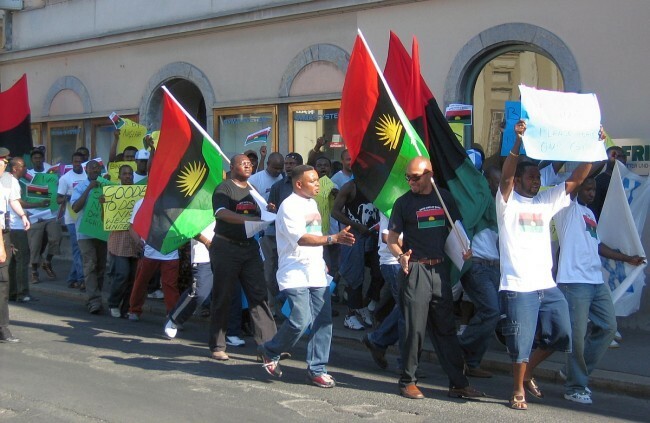 As members of the Indigenous People of Biafra (IPOB) and the Movement for the Actualization of Sovereign State of Biafra (MASSOB) continues to stage peaceful protests across states in the South East and South-South zones, demanding the release of detained IPOB leader, Mr. Nnamdi Kanu, there appears to be a growing lack of cohesion among Igbo leaders in coming up with measures to address the issues. Last week, a meeting of South East governors, the apex Igbo socio-political group, Ohaneze Ndigbo and MASSOB called by the Imo State governor, Owelle Rochas Okorocha which was aimed at deliberating on the unfolding events could not hold due to rift bothering on where the meeting would be held, as well as which faction of Ohanaeze leadership will represent the group. It was gathered that while Okorocha had billed the meeting to hold in Owerri, the Imo State capital, his colleagues insisted that Enugu should be the venue since it had always been the headquarters of the South East zone. The Imo governor, it was gathered, however, remained adamant prompting other governors to opt out. In a similar twist, Ohanaeze which has over time been engulfed in leadership squabbles with Chief Garry Enwo Igariway and Chief Ralph Obioha heading different factions, also failed to come together. Although various Igbo groups such as Aka Ikenga led by Chief Goddy Uwazurike and the Igbo Leaders of Thought (ILT) headed by Professor Ben Nwabueze all appear to be in support of Igariway, Obioha has refused to back down and has, in fact, become the more vocal of the two. While speaking at the launch of Igbo Life Magazine in Lagos recently, Chief Uwazurike maintained that the Igbo were still under Ohanaeze Ndigbo, adding that its recognized leader remains Chief Igariway. He went on the label others parading as leaders of Ohanaeze as impostors wanting to foist divisions in Igbo land. “We the Igbo know ourselves, we know our leaders. We are all under Ohanaeze Ndigbo and the president general is Chief Garry Igariway. Any Igbo man who wants to do anything outside the leadership of Ohanaeze is a joker, or somebody trying to deceive others,” he stated. In a chat with Business Hallmark, last week, Uwazurike however, explained that Igbo leaders were meeting with a view to resolving the issues. Nonetheless, the crack present in MASSOB leadership equally came to the fore in the unfolding events. A faction of the movement whose spokesperson is Comrade Uchenna Madu, and which had maintained unwavering support for Mr. Kanu, insisted that it would not participate in any meeting with Ohanaeze or the governors as long as the IPOB leader remains in detention. “We support the meeting of the South East governors and Ohanaeze Ndigbo, with pro-Biafra groups to douse the tension, but we believe that such a meeting cannot take place while Nnamdi Kanu is still in detention,” Madu said in a statement. Meanwhile, business activities in the strategic cities of Aba, Onitsha, Owerri, Enugu, Awka and Port Harcourt last week reeled under the persistent protests by both members of IPOB and MASSOB as traders locked up their shops mainly for fear of possible vandalism. In Onitsha, many shops at the popular Onitsha Main Market as well as in the Upper Iweka area were shut, and businesses grounded when hundreds of protesters stormed the streets in protest over Mr. Kanu’s detention. “While the protesters were matching from Head Bridge down to Iweka, many people, especially the drug dealers closed their shops for fear of possible vandalism,” explained Mr. Ezeja Victor, an Onitsha resident. “At the Main Market, many shops were also closed as protesters stormed the streets. People feared the protests could turn violent but for the most part, it was peaceful and the police were guiding them to make sure there was no violence. They actually arrested some protesters for disorderly conduct. It hasn’t been a good time for business really,” he said. Similar scenario played out in Port Harcourt, the Rivers State capital on Tuesday when business and commercial activities were halted following protests. Shops along Oyigbo Road to Eleme Junction were locked as the protests escalated causing traffic congestion, a development that prompted the Rivers State governor, Barr Nyesom Wike to ban protests in the city. In Enugu, Aba and Awka, the story was the same, shops closed as protester stormed the streets though they were generally peaceful. Speaking on the development, Barr Okechukwu Okoroji, one time governorship aspirant in Lagos State criticized Kanu over the use of foul language in his broadcast. He noted that the IPOB leader was pursuing his cause in a wrong way as he has only succeeded in alienating people from other zones who have sympathy for his quest with his foul language. “The boy has a good tool in his hands but he is misusing it. He cannot be calling Nigeria a zoo and insulting everyone else and think people will support him. “With that radio station, he should be doing sensitization, not insults. Has he convinced the minority groups to support his cause? Has he even convinced other Igbo people who have investments all over the country?” he queried. As the Biafra agitation continues, a member of Abia State House of Assembly, Chukwudi Apugo has expressed worry that if no urgent solutions are proffered to the lingering Biafran agitation , miscreants might hijack the protests and plunge the country into another needless upheavals. He therefore appealed to the Federal Government to release the detained Radio Biafra Director, Mr. Kanu in order to avert another preventable civil war in Nigeria. Apugo who spoke with Business Hallmark in Umuahia on the rising wave of protests across South- East and South- South geopolitical zones over the detention of Kanu, said the looming danger had to be averted before it got out of control. He said that the momentum the protests were gathering in recent times called for concern and urgent attention before it snowballed into a major national crisis or civil unrest. The lawmaker said that while he was not recommending the fragmentation of Nigeria as being canvassed by the pro- Biafra groups, there was need for the federal government to negotiate with the agitators with a view to reaching a compromise. He noted that Nigeria might not survive another uprising from the South in addition to the current insurgency in the North. Apugo further observed that dismissing the protesters as miscreants would be a grave error in view of the increasing number of people identifying with their cause both within and outside the shores of Nigeria. He appealed to the federal government to see reason to release Kanu if he had met conditions for his bail as claimed by his lawyer to save the country unnecessary heat being generated by his continued incarceration. He particularly noted with concern the disruption of economic activities during the protests and the likelihood of violent clashes between the protesters and security agents. He also appealed to Igbo leaders to see the urgency the agitation deserves and rise to the occasion to avert converting the South East zone into another theatre of war. At any rate, the continuous detention of Kanu by the DSS and the million-man-march in parts of the Eastern states of Nigeria calling for the release of Kanu has formed topics in many drinking parlours and public places in Abia state. According to sources Kanu, who doubles as the supreme leader of the Indigenous People of Biafra (IPOB) and the Director of Radio Biafra is reported to be hale and hearty and in very high spirit. The source added that the British government in spite of its make-believe press statement is also concerned about the continued detention of Kanu, who despite having dual citizenship is still their citizen. The British High Commissioner to Nigeria and his team were said to have visited Kanu in his detention camp. Another delegation from the United States government is also expected to meet with him later in the week. However, a war veteran, Chief Ikoro Akasi in a reaction noted that the agitation for Biafra after 45 years the Nigeria/Biafra civil war ended is an indication that those involved in that war have not been given the right of place in the country. He blamed the National Orientation Agency (NOA) in Nigeria for not drawing up a programme that should have worked on the psyche of Nigerians after that war. Akasi, however, advised President Buhari to implement the Reports of the National Conference to douse tensions in Nigeria.